WASHINGTON — The Trump administration announced Monday that it is designating the Iranian Revolutionary Guard Corps, or IRGC, as a Foreign Terrorist Organization, the first time the U.S. has used the designation on part of another country's government. "This unprecedented step, led by the Department of State, recognizes the reality that Iran is not only a State Sponsor of Terrorism, but that the IRGC actively participates in, finances, and promotes terrorism as a tool of statecraft," President Donald Trump said in a statement. "The IRGC is the Iranian government's primary means of directing and implementing its global terrorist campaign." When the designation takes effect in one week, the military branch of the Iranian government will be on the same list as terrorist groups such as ISIS, al Qaeda, Hezbollah and Hamas. The IRGC was already determined by the United States to be a Specially Designated Global Terrorist group but this new designation will forbid providing "material support or resources" to the group, placing even further restrictions on those still doing business with Iran. Those found in violation of the law could face criminal charges including up to 20 years in prison. 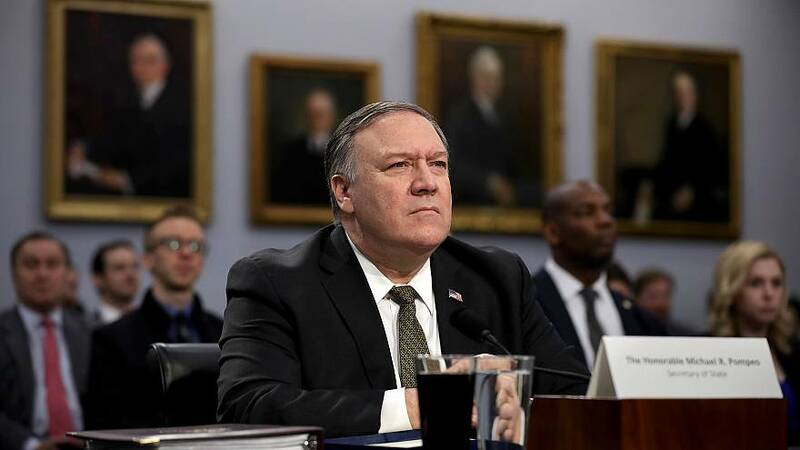 "If you're the general counsel for a European financial institution today there's more risk," Secretary of State Mike Pompeo warned Monday. "This will require more diligence to be done by every business that is considering doing things that are even now second and third orders removed from what you might think of as a traditional connection to the Iranian economy." A senior administration official said the designation "to the extent there are statutory authorities" also gives the U.S. the authority to target Qasem Soleimani as it would the leader of any terrorist organization, such as the head of ISIS, al-Baghdadi. "That's another consequence," the official said. The Foreign Terrorist designation also comes with travel restrictions for the IRGC and those affiliated that could have broad impact. One Senior Administration Official said, "I feel pretty certain if you're in the ministry of defense you're not going to get visas." The decision has been debated inside the Trump administration for months in multiple meetings at a senior and deputy level. At one point they considered only designating the Quds Force but determined the IRGC did enough destabilizing activity on its own. It also sparked concern by some at the Pentagon, that the designation would endanger US forces, according to a senior administration official. Iranian Foreign Minister Mohammad Javad Zarif responded Monday by advocating Iran place U.S. Central Command on their terror list, according to Iranian state run news agency IRNA and Maj. Gen. Mohammad Ali Jafari, the commander of Iran's Revolutionary Guard Corps, threatened over the weekend to target the U.S. military. "If (the Americans) make such a stupid move, the U.S. Army and American security forces stationed in West Asia [Middle East] will lose their current status of ease and serenity," Jafari said Sunday, according to FARS News Agency. "I can assure you that we take force protection very, very, seriously," Nathan Sales, Coordinator for Counterterrorism at the State Department told reporters Monday. "We ran a robust inter-agency process to make sure that all interested parties are prepared for whatever the Iranian regime might throw at us." The decision comes almost one year after the Trump administration announced its decision to withdraw from the Iran nuclear deal. By blacklisting Iran's most important military unit, the sanctions could complicate any attempt by a future president trying to return the United States to the deal with Iran, both advocates and critics of the move said. "This is part of a strategy by Iran hawks to layer on sanctions to make it more difficult for Democrats to get out of the deal," a Republican congressional aide told NBC News. The decision came after several Democratic presidential candidates said they favored having the United States re-enter the agreement and the Democratic National Committee has said it supports a return to the deal. In an op-ed last week, Mark Dubowitz, an influential advocate of a tough line on Iran, argued for designating the Revolutionary Guard and other steps to prevent the next president from returning to the agreement. "The administration could also build a wall of additional sanctions that a pro-Tehran successor could not easily dismantle," wrote Dubowitz of the Foundation for the Defense of Democracies think tank, which favors hard-hitting sanctions on Iran. Instead of tying the sanctions to the country's nuclear program, the designations could only be lifted if the regime halted its support for militants across the region, its work on ballistic missiles, and its human rights abuses, Dubowitz wrote. Republican Sen. Ted Cruz of Texas, who has sponsored legislation since 2015 to blacklist the IRGC, welcomed the announcement and said the White House should follow up with additional measures to hold the Revolutionary Guard accountable for its role in the war in Yemen, its support for Hezbollah in Lebanon and its backing of the Syrian regime of Bashar Assad. Trita Parsi, a supporter of the Iran nuclear agreement and president of the National Iranian American Council, said the move could undermine any future attempt to forge a diplomatic dialogue with Iran. "Even if future administrations would want to resolve tensions with Iran, the spiderweb of sanctions and terrorism designations makes any meaningful movement towards a diplomatic breakthrough with Iran politically unfeasible in Washington," Parsi said. Even before today's announcement the administration had already designated over 970 Iranian entities and individuals in 26 rounds of sanctions.